Large village with 3,200 inhabitants, 15 kms west of Tiszavasvári. On 26th August 1846, the regulation of the river Tisza was started here and ultimately the river was shortened by 453 kms. In commemoration of this event Széchenyi monument and Pál Vásárhelyi statue were erected. The oldest edifice is the Calvinist church (of Gothic origin, late Baroque building from 1768). 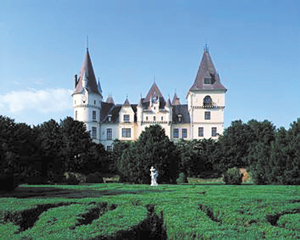 The early eclectic Andrássy mansion (1860) houses a castle hotel, conference halls and a restaurant. The 'Tubus' granary is a monument of agricultural history. Outstanding programmes of the village are the Village Days (6-8th July), and the Tiszadob Piano festival (the beginning of August). Permanent exhibition of the painter, Mátyás Réti can be visited in the Museum of Local History.